Perfect for an open-air adventure and to experience the sidecar when time is limited. Cruise the lit-up streets after sunset and raise your glass of bubbles to the city that never sleeps. A cold bottle of sparkling wine is included for a fun moment. NB: Please enter 1 next to "2 passengers" if you are booking for 2 persons. Indulge in a glamorous evening ride in a private convertible jeep. Start with the enchanting lightning roofs of the Jing'an Temple, the world-known “must seen by night” Huai hai road and go on an impressive drive down the Bund to enjoy both sides of the river with the fascinating Pudong skyline facing 1930s buildings. Make a hook at the quiet Suzhou Creek to make a toast to this unforgettable evening with a glass of sparkling wine and end your night with the living heritage of the former international concessions while driving on People's square and Nanjing Road. Just follow the lead of your Insider, as he will drive you through the city non-stop and serve you a glass of bubbles. Our convertible jeeps can seat up to 4 passengers from 2 to 99 years old, but for optimal comfort we recommend 3 passengers per jeep. STANDARD MEETING POINT : Our rides start from the Bitter Café in the Former French Concession (Wuyuan Road 58). At the end of your ride, we will drop you back at the Bitter Café. Our rides come with knowledgeable Insiders immersed in local culture, characterful vintage vehicles, weather protection and a bunch of gadgets. Rides exclude meals unless specifically mentioned. For legal & safety reasons, you are not allowed to drive a jeep. In case of a no-show or a cancellation less than 48h before the scheduled departure, you are held responsible for the total amount of your ride. Get a glimpse of this fascinating city from its famous old town to the futuristic Pudong skyline through the former foreign concessions. Take our most sold ride, when you are new to Shanghai and you want to catch a glimpse of the city. Ride under a leafy archway of plane trees, admire Normandy style cottages and relive the atmosphere of “Paris de l’Orient”. May it be in one of the former concessions, the old town or little Tokyo. You may also drive on a bridge over the Suzhou Creek and catch a glimpse of the Pudong Skyline. Night-time rides available. We offer rides in different languages. When you send us your booking form you can ask for an Insider who speaks a language other than English. Tours in French, Dutch & German available. Designed for all the architecture & design lovers out there. Ben Wood, China’s most prolific foreign architect of the past 20 years, gathered just for you, all the Shanghai architectural tops and flops. Designed by Ben Wood, the famous American Architect behind Xintiandi, this ride by vintage convertible jeep is a must-do. Through his eyes, you will discover Shanghai's first American built skyscraper and its strong message to the Soviet Union, understand Fengshui with the famous People Square and take a stop at a mysterious dragon pilar. To really feel the power of this fast-pace city, cross the river and go stand at the foot of China's Manhattan, take a glance at the China Pavillon and to what Ben Wood qualifies as the world's best Arena and finish your ride with a mechanically operated building. Ideal to explore one area in depth or to get an overview of the entire city. Most popular with long-term expats as well as travellers! Perfect for people willing to have a whole overview of Shanghai’s contrasts and a deeper understanding of the city. Open your eyes to colourful stalls, tickle your taste-buds with century eggs or snakes and blend in with lively neighbors Depending on your personal interests, this ride may have 4-6 stops. You could visit the largest Art-deco abandoned slaughterhouse of the Far-East, drive through the old Shanghainese traditional neighborhoods or take a ferry from Puxi to Pudong and have a photo stop near Shanghai Tower. Discover the most trendy, contemporary art places in downtown Shanghai! Cruise around and stop for a private tour of each gallery. Finger food and bubbles included. Discover the most trendy, dynamic and contemporary art places in downtown Shanghai. Cruise around and stop for a private visit of each of the 3 to 4 galleries selected according to your interests. Shanghai has always been a hot spot for art with its many Art-Deco buildings scattered all over the city and its rich street art production. A bottle of sparkling wine and fingerfood are included. NB. This ride is not available on Mondays. 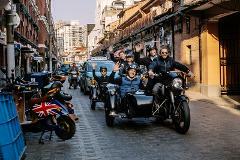 Zip around town in a convertible jeep and explore the mansions of the elite in the former concessions, stop for tea at Shanghai's oldest private residence, have lunch at a place of worship and take in the Bund views from a secluded rooftop. 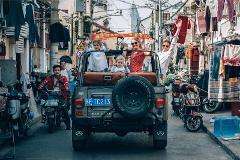 From the mansions of the elite in the Former French Concession, to the oldest private residence in Shanghai, you will learn about the incredible history and witness some of Shanghai’s most fascinating secret locations all while being zipped around in one of the coolest vehicles on the road: a vintage convertible Jeep. You will have the opportunity to enjoy a delicious lunch at a virtually unknown temple and sip a refreshing drink overlooking one of Shanghai’s best kept secret viewpoints. Just follow the lead of your Insider, and expect to spend about 50% of the time driving and 50% exploring on foot. Our convertible jeeps can seat up to 4 passengers from 2 to 99 years old, but for optimal comfort we recommend 3 passengers per jeep. STANDARD MEETING POINT : Our rides start from the Café Bitter in the Former French Concession (Wuyuan Road 58). At the end of the ride, we will drop you back at the Café Bitter. 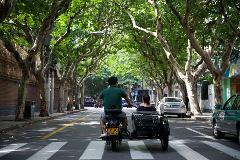 Unravel Shanghai's divers and fascinating history, as you explore little known lanes in the old town and enter prominent landmarks in the former French concession. Shanghai is the perfect blend of the past meeting the present. Hop on our vintage convertible jeeps for an eye-opening ride in some the most well-preserved neighbourhoods. In the winding alleys of the old town, among the locals still resisting the wave of modernity surrounding them, in the mythic French Concession with its quaint yet charming atmosphere or from the boardwalk on the Bund side with a view on the Pudong skyline, this very unique blend between ancient times and modernity is taking shape before your eyes. Just follow the lead of your Insider, and expect to spend about 70% of the time driving and 30% exploring on foot. Our convertible jeeps can seat up to 4 passengers from 2 to 99 years old, but for optimal comfort we recommend 3 passengers per jeep. Known as a place of vice and indulgence, the so-called “Paris of the east” was and still is a unique neighborhood in Shanghai. With its tree-lines avenues, magnificent mansions and Art Deco heritage buildings, this is a must-do. In its heyday, Shanghai became know as "The Paris of the East", a place of vice and indulgence to make ends meet: drugs, prostitution and gambling until things took an unexpected turn... Take a seat in our vintage convertible jeep to travel back in time and explore a few of these magnificent old mansions spread out in a labyrinth of greenery and admire its very rich Art Deco heritage while walking in the corridors and banquet rooms of the former "French Club".